The Russian government’s last line of defense against its critics is that they are mentally unstable. Sometimes, this is its only line of defense. These accusations of mental instability are not random. @DFRLab tallied the use of the two terms by the Russian Foreign Ministry, and by Russian state propaganda outlets, since 2001. Official uses of “Russophobia” exploded after the Crimean annexation in March 2014. Initially used to justify the annexation, the term was subsequently used to attack foreign critics of the Russian government, including those who imposed sanctions on Russia, especially Canada, the European Union, and U.S. Congress. “Anti-Russia hysteria” took off later, surging in 2017. It was mainly used to describe the reaction to Russia’s interference in the U.S. elections, often in connection with terms such as “witch hunt” and “McCarthyism.” It was especially used by RT. These attacks fit within the Kremlin’s broader response pattern of “dismiss, distort, distract, dismay.” However, the decision to call its critics mad suggests that the Russian government finds it hard to prove them wrong. To say that a critic is critical only because they have a phobia is a last-ditch argument which betrays the fundamental weakness of the Kremlin’s position. “Russophobia” — the irrational fear or hatred of Russia or Russians — barely featured in Russian official statements before 2014. 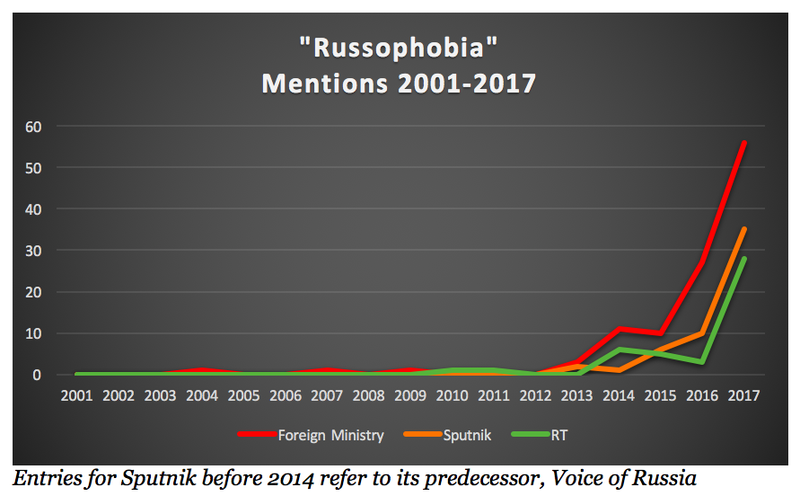 According to a search for the term “Russophob” (to encapsulate the variants “Russophobia,” “Russophobe” and “Russophobic”) on the English-language version of the Foreign Ministry’s website, it was only used six times from 2001 to the end of 2013. RT, the Russian government’s “information weapon,” added two more. Early use of the term concerned disputes between Russia and its neighbors. Latvia was the target in 2004 after it expelled a Russian diplomat, Ukraine in 2007 and 2009, and unspecified former-Soviet states in 2011. The underlying theme in the latter cases was whether the Red Army of 1944–45 should be viewed as a liberating or occupying force. Criticism of the Red Army is an exceptionally sensitive point in Russia, viewed with a quasi-religious fervor; the Foreign Ministry has often referred to critics of the Red Army as “blasphemous”. Later use of the term, however, focused on accusations of corruption, crime, and human rights violations. In 2010, RT headlined an article on the extradition of suspected Russian arms dealer Viktor Bout to the United States as “Russophobia”. The word only appeared in the headline, not the article; it can only, therefore, have been an editorial insertion by RT. In 2013, the Foreign Ministry used the word three times. Two concerned the so-called “Magnitsky Act” in the United States, a law which sanctioned Russian individuals linked to the 2009 death in police custody of Russian lawyer and corruption investigator Sergei Magnitsky. The third attacked a European Parliament resolution which had proposed making EU concessions to Russia in areas such as visa liberalization conditional on progress in democracy. The ministry’s language was, to say the least, shrill. One statement called U.S. Senators John McCain and Ben Cardin “rabid Russophobes,” while another presented the European Parliament’s behavior as inconceivable. Neither the Magnitsky Act nor the European Parliament’s resolution could justifiably be called “Russophobic,” in the normal sense of the word of “fear and hatred of Russia or Russians.” Indeed, the Act underlined the importance of good relations with Russia, and of human rights in Russia. It is hard to interpret a call for improved democratic standards in Russia as “rabid Russophobia.” This can only realistically be done if the definition of “Russophobia” is extended to mean “criticism of the Russian government,” or if the call is presumed to be insincere, which would make the resolutions Russophobic despite what they say. The likely reason for this rhetoric lies elsewhere. Both resolutions accused the Russian government of failing to live up to democratic standards. Given the events of 2011–12, when thousands of Russians protested against claims of vote-rigging, this was legitimate criticism. As such, it was dangerous for the Russian government because it was accurate — not because it was false. The accusations of “Russophobia” in 2013 thus appear to have been an attempt to shout down legitimate criticism. That tactic continued in 2014; what changed was the scale. In 2014, Russia annexed Crimea and triggered an armed conflict in eastern Ukraine. In July 2014, the conflict led to the shooting-down of Malaysian Airlines flight MH17, killing all 298 civilians on board. Periodically throughout 2014 and into 2015, the Russian armed forces launched attacks into Ukraine, while the Russian government denied their presence. Again, the evidence was not on Russia’s side. Selfies posted by serving Russian soldiers proved their presence on Ukrainian battlefields. An international tribunal concluded that the missile which had downed MH17 entered Ukraine from Russia. On the diplomatic front, a sweeping majority of UN member states rejected Russia’s annexation of Crimea as illegal. As criticism mounted, the Foreign Ministry’s use of “Russophobia” soared. The word featured in eleven separate statements in 2014, almost double the total number of uses in the preceding thirteen years. It leveled off at ten uses in 2015, more than doubled to 27 uses in 2016, and doubled again to 56 uses in 2017. These figures were arrived at by searching the term “Russophob” on the ministry’s English website, and excluding results in which the word was posed as a question by journalists, or responded to such questions. Most early comments sought to justify the annexation of Crimea by characterizing the Ukrainian government as Russophobic, as in President Vladimir Putin’s statement on March 18. In fact, while far-right groups did play a role in Ukraine’s revolution and the subsequent conflict, they were, and continue to be, a fringe group who have never had more than a minuscule presence in the parliament — significantly less than parliamentary far-right parties with which the Kremlin has cordial relations in countries such as France and Germany. Even at this stage, however, other critics of Kremlin policy were given the “Russophobia” label. They included the European Parliament, which accused the Russian government (entirely accurately) of destabilizing eastern Ukraine. The Russian response was — again — shrill. Some of the attacks were more nuanced, and portrayed the EU (and, later, NATO) as being the “hostage” of a “Russophobic minority,” in an apparent attempt to divide member states. Canada fell a victim in January 2016, after it implemented sanctions against Russia. The equation of sanctions with insanity was made explicit by Foreign Minister Sergei Lavrov himself. The attacks were repeated in 2017, and were again explicitly linked with sanctions and irrationality. The tipping point came in October 2016, after the U.S. Office of the Director of National Security and the Department for Homeland Security confirmed that Russian hackers had targeted the Democratic presidential campaign. In the following fifteen months, the Foreign Ministry accused the U.S. leadership of Russophobia nineteen times, with quotes such as these. 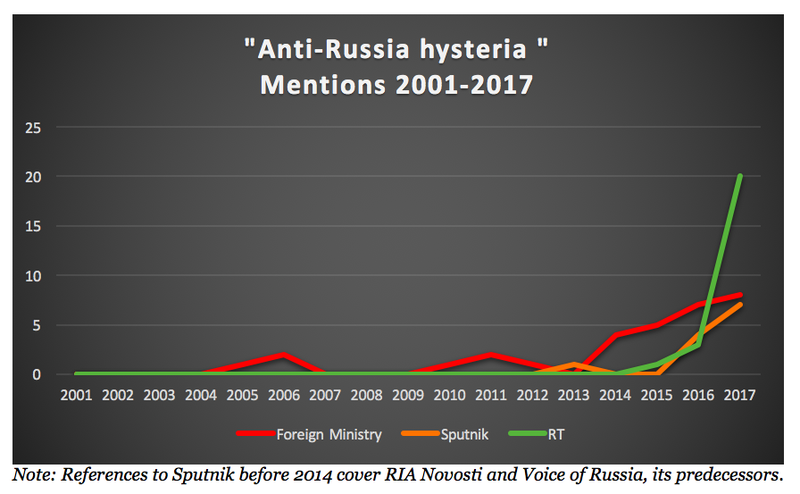 Note the growing use of the term “hysteria” alongside “Russophobia”. As in Ukraine, these comments were not made at random. They came in the context of increasing evidence of Russian influence operations during the U.S. election, notably the hacking of Democratic emails (attributed to Russian hackers by cyber-security analysts and the U.S. and Dutch intelligence services) and the deployment of thousands of fake social media accounts to promote divisive messages (facts confirmed by Twitter and Facebook). The accusations of “Russophobia” therefore appear, again, as an attempt to shout down the critics without discussing the substance of their criticisms. The Foreign Ministry’s rhetoric of “Russophobia” was complemented by Russian state English-language broadcasters RT and Sputnik. This is unsurprising, given the role both outlets play in Russian government messaging (for an analysis of RT’s role, see here). Both outlets’ use of the term soared in 2017, from three uses up to 28 in RT’s case, and from ten up to 35 in Sputnik’s. Most of these comments came in the “opinions” section, but were made so consistently that they appear to constitute an editorial policy. Actor Morgan Freeman (@DFRLab analyzed the full-spectrum attack on Freeman here). Sputnik’s coverage was similarly wide-ranging. For full disclosure, it once listed the author of this article among “the EU’s leading Russophobes,” alongside Applebaum, Lucas and other analysts of Russian propaganda. 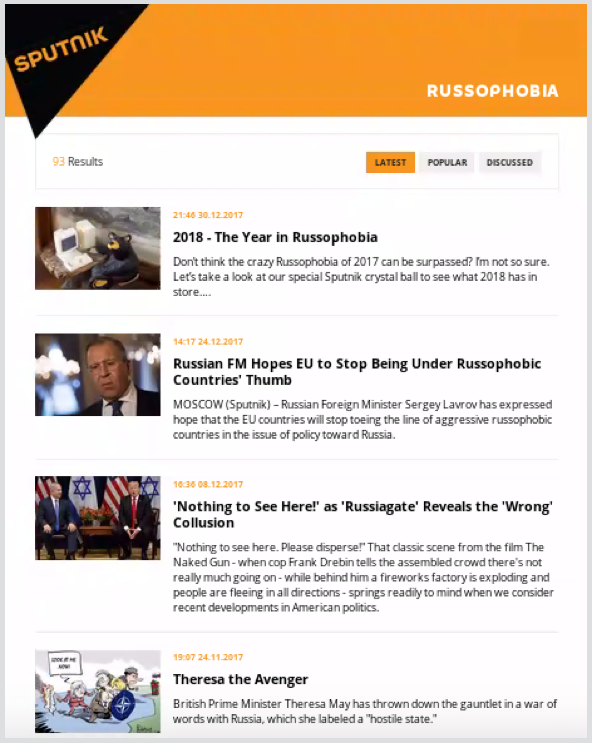 The agency even added “Russophobia” as a generic tag to its articles; curiously, a number of its stories focused on Sweden, which it portrayed as both Russophobe and paranoid. Coverage such as this complemented the Foreign Ministry’s statements, rather than replicating them. The lists of “Russophobes” were wider, and the rhetoric more aggressive. Some of the authors may have genuinely believed in their thesis of elite mass psychosis; other references, such as to the “Russophobia bacillus,” appear intended as deliberate mockery. Their combined effect, however, was to paint an image of Russia’s critics as routinely irrational, and thus to reinforce the ministry’s point of view. Russia’s official narrative of “Russophobia” appears to be a response to the international condemnation which the Russian government’s actions provoked. While it was initially used to justify the illegal annexation of Crimea in 2014, the term progressively expanded to take in international bodies which sanctioned Russia for its broader actions, and politicians and journalists who criticized those actions. Yet those critics are not irrational, because the evidence that Russia did conduct the actions for which it was blamed is convincing. Serving Russian soldiers posted selfies from Ukrainian battlefields; international investigators traced the missile which shot down MH17 to Russia; Facebook and Twitter confirmed the operations run from Russia on their platforms; intelligence agencies and cyber analysts attributed the hacking of American political campaigns to Russia; the IOC found that Russian athletes were part of a state-run doping scheme. The Kremlin has denied all those actions, but the evidence is against it. The “Russophobia” narrative is thus a weak one. Accusing a critic of insanity or an irrational fear is a poor rhetorical tool, especially when the same allegation is used against so many different critics, on so many different issues. Moreover, it is a tool which is most likely to be used when stronger, evidence-based arguments are unavailable. If anything, the “Russophobia” narrative reveals the weakness of the Kremlin’s position. It cannot disprove the claims against it: the evidence is too strong, and continues to grow. Nor, however, can it admit to the actions it hitherto denied, for domestic political reasons. The Russian government is trapped in a narrow, and narrowing, rhetorical space in which calling its critics “Russophobes” is one of the few defenses left.